His majesty football rules the world of both offline and online entertainment this time in form of a 5-reel 3-row video slot machine with 5 fixed paying lines produced by Merkur. The sports-themed game features Wilds and a non-progressive jackpot prize of €100.000 you can score by implementing some tips closely elaborated in the Gold Cup slot review. Want to see how Gold Cup works? Select a recommended casino site from the list below and start playing for free or real – our screenshots will give you a sneak peek! Forming a winning combination from matching symbols lined-up from the left to the right side of the screen is your main task, while we’ll leave football to the professionals. Gold Cup works as the wild symbol that can replace all other symbols and help you form a winning combination. 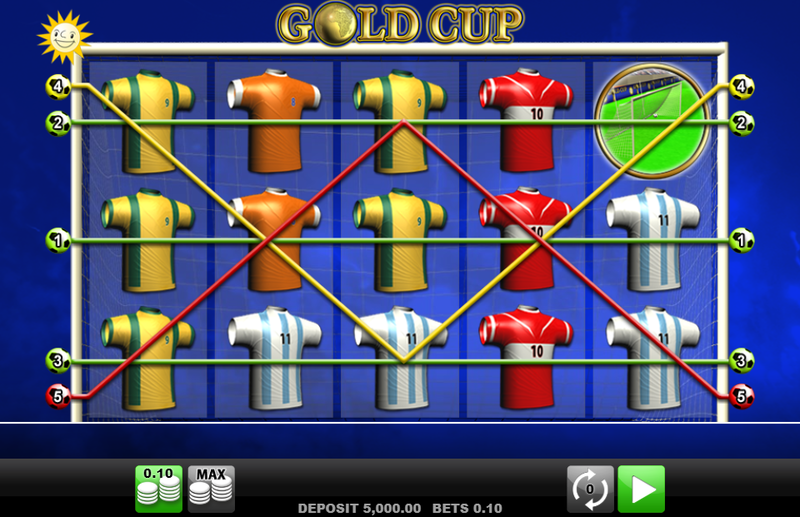 Football jerseys of the world’s most popular teams will bring up to 3.000 coins, while you can score a big win of 10.000 coins each time when 5 or more Goal symbols appear on adjacent reels. A striker dressed in the Italian national team colors is a symbol with the highest rating on the entire paytable and you will receive 100.000 or the equivalent amount in your currency whenever you land 5 of the kind. Whenever you land a winning combination, there is a chance to score a big win if trigger the Gamble feature and see if Red or Black card is coming. This way you can earn 5x your initial stake. Yes, you can try the demo mode or play for real on your mobile device without a need to download any kind of app. 3. What is the RTP factor of Gold Cup? Officially, the expected RTP stands at 96.00% on all Merkur powered sites. These are the odds much better than the actual football winners have. With its interesting idea that may bring football fans closer to the world of online entertainment, Gold Cup will also attract fans of other sports and slots professionals thanks to its attractive jackpot prize and a range of betting possibilities.